Organizations today are under relentless pressures to deliver innovative products to the marketplace, improve quality and do it at lesser costs to expand their global footprint and reach to newer markets. The need for agility and flexibility to respond to rapidly changing customer preferences is a key competitive advantage for businesses. In a competitive environment visibility into product development, global sourcing, and a quickly expanding marketplace, real time information sharing and collaboration between teams involved in Product design, development, supply and merchandising will ensure this competitiveness. Businesses are turning to mobility solutions to increase collaboration across the enterprise and the supply chain, starting from the early product development phase. 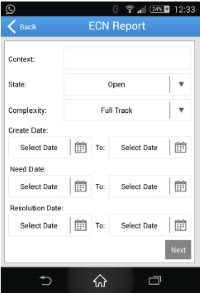 Qiwk [Pronounced Quick] Mobile enables your workforce to seamlessly connect to your PLM environment on the go. Anytime and anywhere, whether out on the Manufacturing location in Asia on the Shop floor or while at a customer location. When critical decisions can't wait for you to return to your desk, Qiwk Mobile makes sure that your decisions reach your team in time. Qiwk Mobile facilitates decision-making and at the time and place a decision needs to be made. Search and view product details including assemblies, components, documents and change objects. Manage your workflow task items. View Bill of material and expand assemblies till nth level. Upload documents/pictures from mobile device to server. Simpler interface for both phones and tablets. Qiwk mobile is a platform agnostic Mobile First PLM solution keeping in mind the needs of enterprise to allow its users to use mobile devices of their choice. This is the only Mobile First PLM solution in the market available in multiple mobile platforms. Currently the tool is offered for PTC’s Windchill PDMLink solution. Available on request for other PLM solutions including - Aras, Dassault Enovia PLM Oracle Agile and Siemens Teamcenter.